Some of my readers make pizza dough, tomato sauce, dice vegetables, grate cheese, own a pizza stone, and create amazing pies in their oven. Thank you for reading Snack-Girl, Martha Stewart. But, the rest of us open a box and toss a frozen pie in a preheated oven waiting the 10 minutes it takes to heat and are finished. Or, we just call a number and a sweet teenager shows up with a steaming cardboard box. There is a middle ground between Martha and the rest of us. You just need to believe! 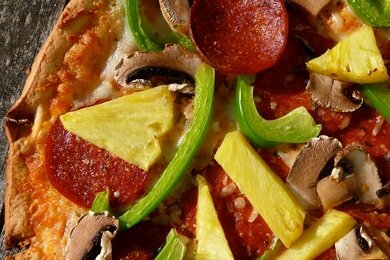 All you have to do is add some of your favorite fresh vegetables to your favorite frozen pizza and you could look like a gourmet goddess. That is my method with the pizza photographed here. I used a Newman's Own Pepperoni Pizza. I sliced mushrooms, green pepper, and pineapple and tossed it on before I put it in the oven. Doesn't it look delicious? And it tastes SO much better than just the pizza alone - or the pizza with pre-frozen vegetables. You can keep the calories under control by buying the 200 calorie pizzas. Vegetables are going to add negligible calories to the finish product. Pizza is an excellent "vegetable delivery device" for kids and adults. The cheese makes vegetables more palatable. Broccoli, spinach, kale, and other green things just taste better with cheese. I do this pretty regularly with my frozen gluten-free pizzas. Since there are only like 3 varieties, and the stores don't always sell more than one, you gotta make up your own. They're always better anyway!